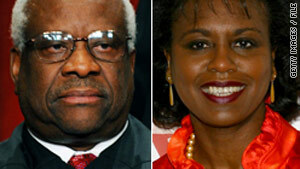 Anita Hill accused Supreme Court Justice Clarence Thomas of sexual harassment. Ginni Thomas says she reached out to Hill to extend "an olive branch"
Boston, Massachusetts (CNN) -- Anita Hill, whose accusations of sexual harassment almost derailed Supreme Court Justice Clarence Thomas' high court nomination, has no plans to apologize for the charges she made nearly two decades ago. The response from Hill, now a law professor at Brandeis University in Waltham, Massachusetts, comes following a voice-mail message left for her by Thomas' wife, Virginia, over the weekend, requesting an apology. Charles Radin, the Brandeis director of news and communications, said Hill received the voice mail and turned it over to the campus Department of Public Safety, which then turned it over to the FBI. Special Agent Jason Pack, an FBI spokesman in Washington, declined to comment late Tuesday. "I certainly thought the call was inappropriate," Hill said in a statement to CNN issued by Brandeis. "I have no intention of apologizing because I testified truthfully about my experience and I stand by that testimony." In a statement to CNN, Virginia "Ginni" Thomas said: "I did place a call to Ms. Hill at her office extending an olive branch to her after all these years, in hopes that we could ultimately get passed what happened so long ago. That offer still stands, I would be very happy to meet and talk with her if she would be willing to do the same. Certainly no offense was ever intended." "Good morning, Anita Hill, it's Ginni Thomas. I just wanted to reach across the airwaves and the years and ask you to consider something. I would love you to consider an apology some time and some full explanation of why you did what you did with my husband. So give it some thought and certainly pray about this and come to understand why you did what you did. OK, have a good day." Virginia Thomas is a conservative activist who founded the organization Liberty Central. Hill declined comment to CNN affiliate WCVB outside her Waltham home on Wednesday, saying, "Please, let me go teach my class." Then-President George H.W. Bush nominated Clarence Thomas -- a then-43-year-old conservative from Pinpoint, Georgia -- to the Supreme Court in 1991. The nomination was "instantly controversial," according to an outline of the incident posted on the website for the Center for History and New Media, part of a history class syllabus. African-American organizations, including the NAACP and the Urban League, opposed it, fearing that Thomas' conservative stance on issues such as affirmative action would reverse gains his predecessor, Justice Thurgood Marshall, had helped achieve, the outline said. However, the nomination proceeded to the Senate Judiciary Committee, where the first few days of his confirmation hearings were uneventful, according to the historical account. "When asked about his stance on legal abortion, [Clarence] Thomas claimed that he had not formulated an opinion and the issue was dropped." The nomination went before the full Senate, but a media frenzy developed when Hill -- then a law professor at the University of Oklahoma -- came forward and alleged that Thomas had sexually harassed her years earlier, when he was head of the Equal Employment Opportunities Commission and she worked for him, the outline said. The Senate Judiciary Committee launched an investigation. Hill actually had made the allegations during interviews with the FBI, but they were leaked to the press just before the final Senate vote on Clarence Thomas, according to the Museum of Broadcast Communications' website. The Senate delayed the vote in order to hear more about Hill's allegations. In three days of televised hearings that transfixed Americans, Hill testified that Thomas repeatedly requested dates with her and engaged in inappropriate discussions including references to pornographic material. In his testimony, Clarence Thomas denied the allegations and called the hearings "a national disgrace ... a high-tech lynching for uppity blacks who in any way deign to think for themselves, to do for themselves," according to the museum. Two days later, Clarence Thomas was confirmed on a 52-48 vote. "Although the hearings themselves had no legal significance, to many observers they symbolized a public referendum on sexual harassment and other gender inequities in late twentieth-century America," according to the broadcast museum. The incident has been credited with increasing public awareness regarding gender discrimination and motivating female voters in the 1992 elections, which saw a record 29 women elected to Congress. "Many feminist groups refer to Anita Hill as the mother of a new wave of awareness of gender discrimination, particularly given the attacks on her credibility that she withstood from the white male senators," the museum said. Harriett Woods, then-president of the National Women's Political Caucus, was quoted by the museum as saying, "Anita Hill focused attention on the fact that there were no women in that Senate panel making decisions about people's lives."